You are here: Home / All Posts / A Man and his Grid! 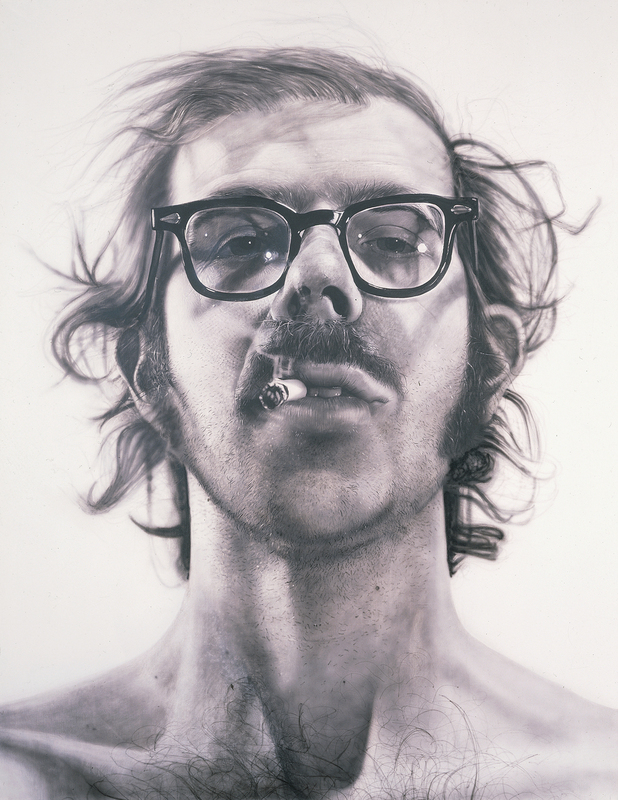 Artist Chuck Close! 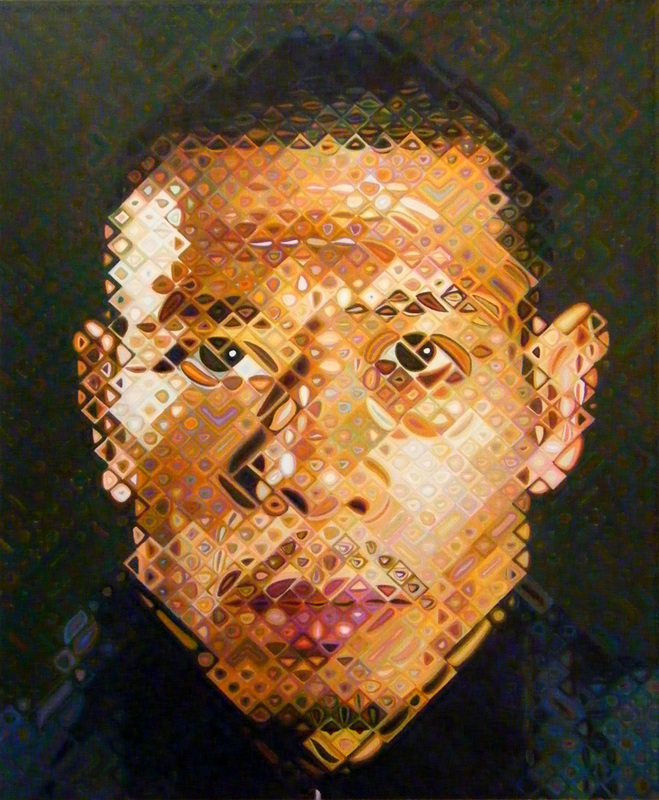 All images and art copyright Chuck Close. 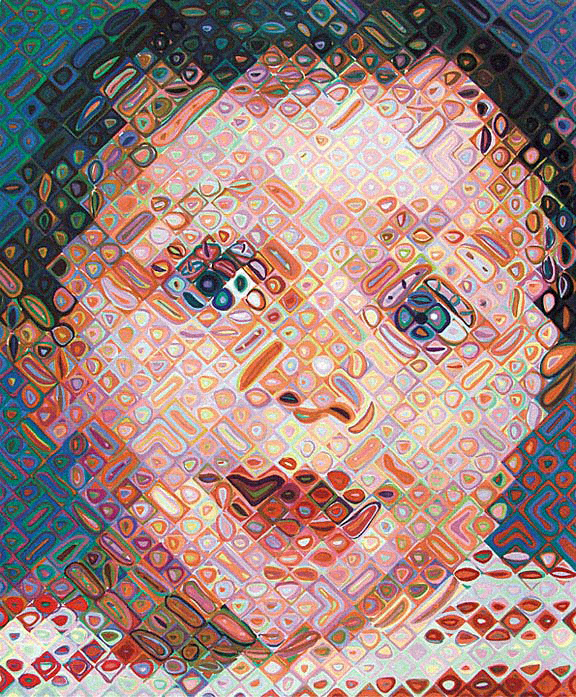 American Artist Chuck Close is an incredible artist, and an even more incredible story. 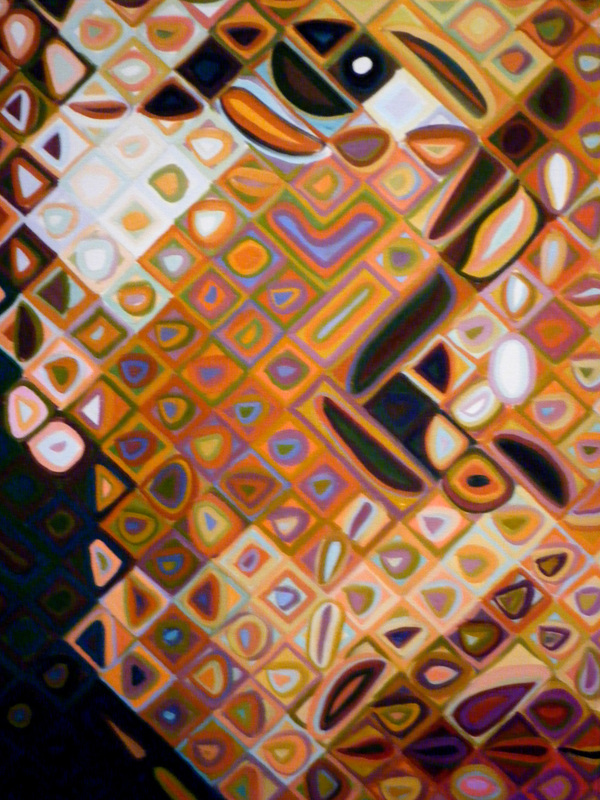 The remarkable career of artist Chuck Close extends beyond his completed works of art. More than just a painter, photographer, and printmaker, Close is a builder who, in his words, builds “painting experiences for the viewer.” Highly renowned as a painter, Close is also a master printmaker, who has, over the course of more than 30 years, pushed the boundaries of traditional printmaking in remarkable ways. Almost all of Close’s work is based on the use of a grid as an underlying basis for the representation of an image. This simple but surprisingly versatile structure provides the means for “a creative process that could be interrupted repeatedly without…damaging the final product, in which the segmented structure was never intended to be disguised.” It is important to note that none of Close’s images are created digitally or photo-mechanically. While it is tempting to read his gridded details as digital integers, all his work is made the old-fashioned way—by hand. Close’s paintings are labor intensive and time consuming, and his prints are more so. While a painting can occupy Close for many months, it is not unusual for one print to take upward of two years to complete. The creative process is as important to Close as the finished product. Although his later paintings differ in method from his earlier canvases, the preliminary process remains the same. To create his grid work copies of photos, Close puts a grid on the photo and on the canvas and copies cell by cell. Typically, each square within the grid is filled with roughly executed regions of color (usually consisting of painted rings on a contrasting background) which give the cell a perceived ‘average’ hue which makes sense from a distance. His first tools for this included an airbrush, rags, razor blade, and an eraser mounted on a power drill. 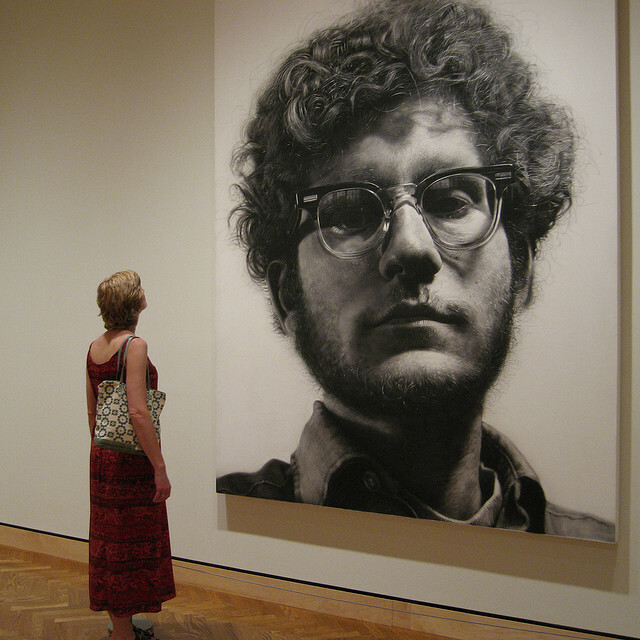 His first picture with this method was Big Self Portrait, a black and white enlargement of his face to a 107.5 in by 83.5 in (2.73 m by 2.12 m) canvas, made in over four months in 1968, and acquired by the Walker Art Center in 1969. He made seven more black and white portraits during this period. He has been quoted as saying that he used such diluted paint in the airbrush that all eight of the paintings were made with a single tube of mars black acrylic. Later work has branched into non-rectangular grids, topographic map style regions of similar colors, CMYK color grid work, and using larger grids to make the cell by cell nature of his work obvious even in small reproductions. The Big Self Portrait is so finely done that even a full page reproduction in an art book is still indistinguishable from a regular photograph. 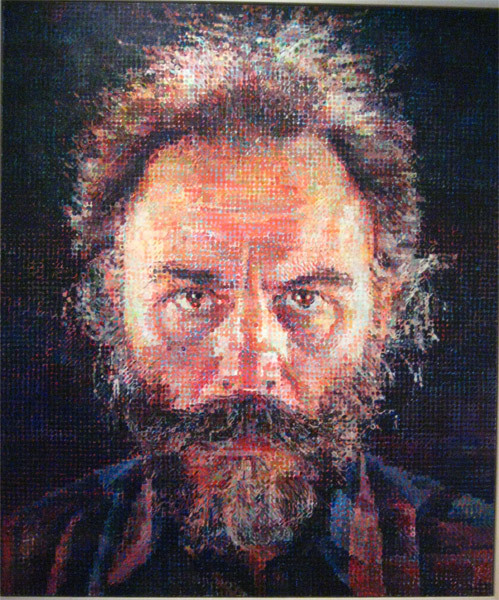 The Big Self Portrait by Chuck Close. All rights reserved. On December 7, 1988, Close felt a strange pain in his chest. That day he was at a ceremony honoring local artists in New York City and was waiting to be called to the podium to present an award. Close delivered his speech and then made his way across the street to Beth Israel Medical Center where he suffered a seizure which left him paralyzed from the neck down. The cause was diagnosed as a spinal artery collapse. Close called that day “The Event”. For months, Close was in rehab strengthening his muscles with physical therapy; he soon had slight movement in his arms and could walk, yet only for a few steps. He has relied on a wheelchair since. However, Close continued to paint with a brush strapped onto his wrist with tape, creating large portraits in low-resolution grid squares created by an assistant. Viewed from afar, these squares appear as a single, unified image which attempt photo-reality, albeit in pixelated form. Although the paralysis restricted his ability to paint as meticulously as before, Close had, in a sense, placed artificial restrictions upon his hyperrealist approach well before the injury. That is, he adopted materials and techniques that did not lend themselves well to achieving a photorealistic effect. Small bits of irregular paper or inked fingerprints were used as media to achieve astoundingly realistic and interesting results. Close proved able to create his desired effects even with the most difficult of materials to control. 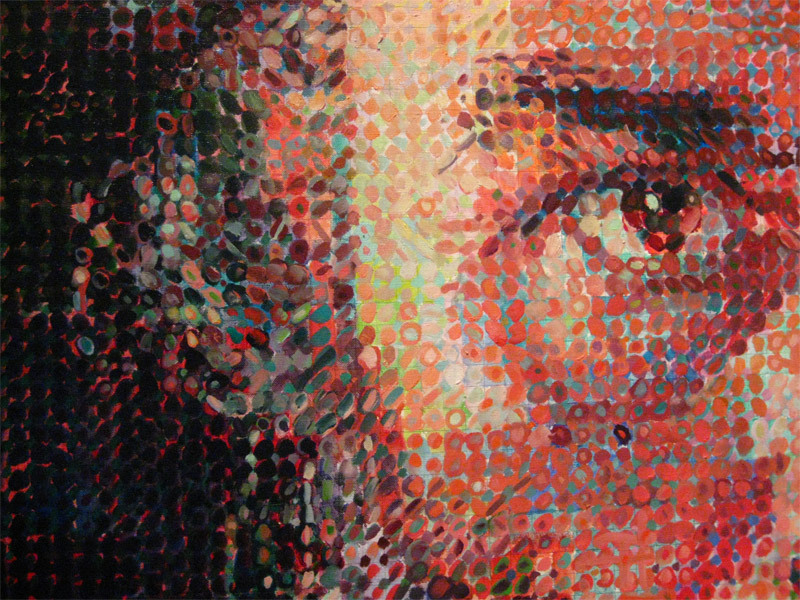 Chuck Close, Give Us Art! salutes you! « The Simple Joy of Joseph York’s Abstract Figure Art! can u post if u have more information about him? Close is such an inspiration. Can’t read enough about him. Thanks for posting! Indeed. When I saw his work I found it interesting (though I have to admit, I’m pretty over portraits!) but the more I found out about his art and him as an artist the more I liked what I saw.